His works were seized, some burned, and he was banned from producing art. After some reeducation, Kazimir was allowed to return to the art world, where he produced pictures of Russian people. Each contained elements of cubism but were essentially cubist. As a possible protest, he signed some of these works not with his name, but with a small black square. When it comes to the peasants he painted, should we assume he painted them ironically? What is the meaning of the cubist representations of their bodies alongside the realist representations of their faces? Is the black square as signature a protest in fact, or an ironic admission of some type of guilt? Without being able to actually ask Kazimir, we are free to interpret as we like. When it comes to Dostoyevsky, one of the patron saints of existential literature, we are similarly free to interpret as we please. His works span 35 years. These were years of social upheaval in Russia and personal trials and tragedies for Dostoyevsky. These trials include a near-death experience (a sudden last-minute reprieve from a firing squad), exile to a labor camp, marriages and a divorce, and the death of a newborn child. His faith was, at times, both his last refuge and sorely tested. Dostoyevsky quotes abound. One of the most popular is this, from The Brothers Karamazov: “Without God, everything is permitted.” In the context of the novel, this is a refutation of socialist ideologies that reject the Orthodox Church, an angry outburst, a statement of bafflement and incredulity. It is generally stripped of all these contexts and just shown as above, in isolation, and attributed to Dostoyevsky. The trouble here is, we cannot know exactly what he meant by this. (Other quotes include: “Beauty will save the world” (The Idiot); “Man only likes to count his troubles; he doesn’t calculate his happiness” (Notes from the Underground); “Taking a new step, uttering a new word, is what people fear most” (Crime and Punishment). First, there is the problem of this being a work of fiction. He never said these words as himself, only through a character in a story. Is this character a protagonist or an antagonist? It is actually a bit difficult to say. The second is that he never really spoke or wrote of his own religious alignments or affiliations. The third is that he changed dramatically over time, as many people do. 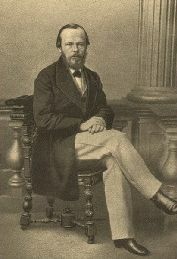 The last is that many of the people and characters in his stories can be linked to actual events and people that he knew (The Idiot, for example, has no small amount of origin in Dostoyevsky’s own epilepsy; the death of his mother from cholera probably resounds through the several characters in his story suffering consumption). To take this statement as an endorsement of a particular faith is a difficult position. We can find an opposite position in Crime and Punishment. Here a young man, Raskolnikov, who decides he is above conventional morality. He commits murder to prove that he can operate beyond prior systems of moral reasoning. The first chapter, my wife says, is the crime, and the rest is your punishment: the next thousand or so pages are his increasing inability to live with what he has done. Guilt builds up so much that he is driven mad (or madder), culminating with his confession. Here man seems to have an innate sense of morality. Without God, this is still not permitted. Working through Dostoyevsky’s works, it is easy to pick out the words that seem to align with our own beliefs be they religious, social, political, anthropological, or philosophical. It is easy because he wrote about so many people doing so many things. Some of his characters advocate a socialist state, others a return to tenant farming. Some men lust after young women, still girls, while another commits suicide rather than follow through with a marriage to a child being brokered by greedy parents. How can we say what Dostoyevsky really believed? And here is a final complication. I was reading The Brothers Karamazov last year when I got a sudden strong impression that I was being had. I wanted to send the book to the Coen brothers—famous for such films as The Big Lebowski, Raising Arizona, Fargo, and Burn After Reading. These are all comedies in which few funny things actually ever happen. They are funny because the characters are so outré, outlandish, bizarre—and yet believable and well-acted. I got this impression suddenly that the characters in Karamazov were not the period melodrama that a casual reading might lead us to think but caricatures. People meant to be laughed at because they are outré and outlandish, little slices of life with maybe no deeper meaning. My wife, Kelly Dias, has a degree in Russian language and literature. I asked her about this impression, as well as some of the more common quotes we see attributed to Dostoyevsky as though he said them in his own voice. My question: isn’t it really difficult to know what he meant? I mean, to know when he was making a real point and when he was being sarcastic?